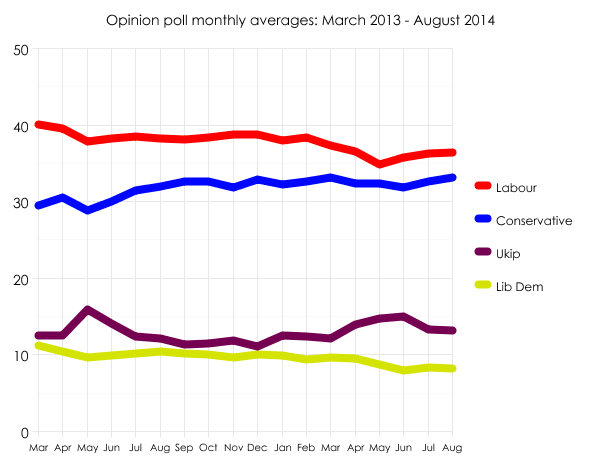 Despite the month proving to be anything but a silly season when it came to news, all four parties have ended August with their polling averages pretty much unchanged. Labour is up just 0.1 percentage point from July on 36.4%; the Liberal Democrats are down 0.1 percentage point on 8.2%; and Ukip is also down just 0.1 point on 13.2%. When I looked at the percentages in the middle of the month, Ukip had dipped down to 12.6% while Labour was on 36.5% and the Tories on 33.5%. The trends suggest the two main parties saw their performance in the polls weaken slightly towards the end of the month, while Ukip staged a bit of a rally. We now wait to see whether Ukip’s return to the headlines at the end of August will prompt any kind of poll bounce, and at whose expense. 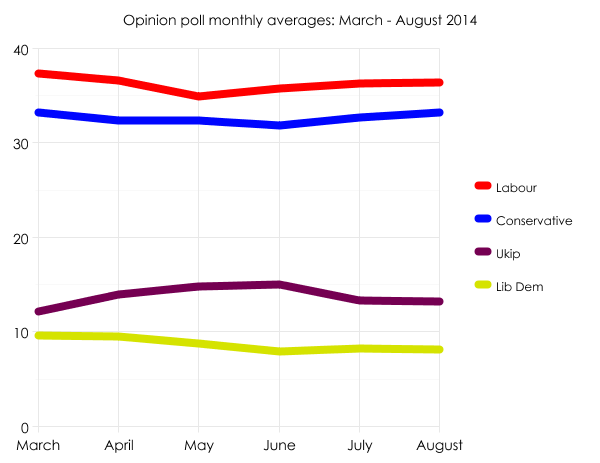 Were August’s poll averages repeated at a general election, on a uniform swing the result would be Labour 341, Conservatives 265, Lib Dems 18, and others 26: a Labour majority of 32.